Awards and decorations of the United States Air Force are military decorations which are issued by the Department of the Air Force to Air Force service members and members of other military branches serving under Air Force commands. Of all five branches of the United States Armed Forces, the United States Air Force currently maintains the highest number of active awards and decorations, including many without equivalent in any other service. United States Air Force awards were first created in 1947. At that time, Air Force members were eligible to receive most U.S. Army decorations and Air Force veterans of World War II were entitled to continue displaying World War II campaign medals. In 1962, following the Cuban Missile Crisis, the Air Force began a concentrated effort to create its own array of awards and Air Force members could no longer receive decorations of the United States Army as a matter of course. By the end of the Vietnam War, most of the modern day Air Force decorations had been established and Air Force members were also entitled to receive and wear all inter-service awards and decorations (see also the interservice Air Medal—which ranks above Aerial Achievement Medal). 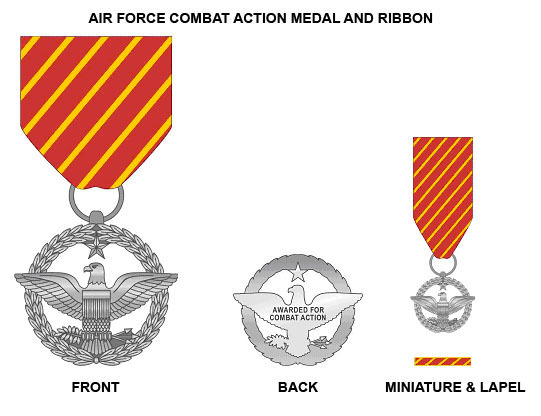 By the start of the 21st century, the Air Force had created several new ribbons as well as an Air Force specific campaign medal known as the Air and Space Campaign Medal. In February 2006, the United States Air Force ceased issuing new awards of the Good Conduct Medal, however, the medal was reinstated in February 2009. The AFGCM has also been back-awarded to those who were in service during the three-year break in new awards. By retroactively awarding those who deserved the medal, it is as if the medal had never been taken away. Air Force Decoration for Exceptional Civilian Service: similar to the military Distinguished Service Medal. A gold-colored medal bearing the Air Force coat of arms with a wreath of laurel leaves. Ribbon is dark-blue silk with three dotted golden-orange lines in the center. Air Force Valor Award: similar to the Airman's Medal. Gold-colored medal design bearing the Air Force thunderbolt on an equilateral triangle surmounted by the Air Force eagle perched on a scroll inscribed "Valor" within an olive wreath. Ribbon is light blue with four yellow stripes, two dark blue stripes, and one red stripe in the center. Air Force Outstanding Civilian Career Service Award: similar to the military Legion of Merit. Bronze medal bearing the Air Force coat of arms with a wreath of laurel leaves. Ribbon is white trimmed in maroon with three maroon stripes in the center. Air Force Meritorious Civilian Service Award: similar to the military Meritorious Service Medal. Sterling silver medal and lapel emblem bearing the Air Force coat of arms with a wreath of laurel leaves. Lapel emblem with ruby indicates receipt of more than one Meritorious Civilian Service Award. Air Force Command Award for Valor: similar to the military Meritorious Service Medal when awarded for heroism. Sterling silver medal of the same design as the Air Force Valor Award. Ribbon is light-blue silk with four yellow stripes and one red stripe in the center. Air Force Exemplary Civilian Service Award: For clearly outstanding service supporting a command mission for at least one year or a single act that significantly contributed to command mission. Similar to the military Commendation Medal. Air Force Civilian Achievement Award: For clearly outstanding service for a single, specific act or accomplishment in support of the unit’s mission or goals. Similar to the military Achievement Medal. Secretary of the Air Force Distinguished Public Service Award: For distinguished public service to the Air Force which translates into substantial contributions to the accomplishment of the Air Force mission. This is the highest public service award bestowed to private citizens by the Secretary of the Air Force. Chief of Staff of the Air Force Award for Exceptional Public Service: For Sustained unselfish dedication, contributions, and exceptional support to the Air Force. Air Force Exceptional Service Award: For exceptional service to the United States Air Force or for an act of heroism involving voluntary risk of life. Air Force Scroll of Appreciation: For meritorious achievement or service that are completely voluntary and performed as a public service or patriotic in nature. Air Force Commander's Award for Public Service: For service or achievements which contribute significantly to the accomplishment of the mission of an Air Force activity, command, or staff agency. In 2018, as part of the Air Force's initiative to reduced directive publications, the eight-page AFI 36-2805 was released, superseding 30 previous AFIs. Guidance for special awards was moved to a website at https://access.afpc.af.mil/. ^ Villagran, Paul (12 February 2009). "Air Force Good Conduct Medal reinstated". Secretary of the Air Force Public Affairs. Retrieved 24 June 2014. ^ "Airmen to see combat medal in April". Archived from the original on February 17, 2007. Retrieved 2007-03-14. ^ Weckerlein, Staff Sgt. Julie (16 November 2006). "General, spouse receive O'Malley award". Air Force News Service. Retrieved 24 June 2014. ^ "Awards". Air Force Association. Retrieved 2019-01-22. ^ Buzanowski, Staff Sgt. J.G. (6 June 2007). "F-16 pilot receives Koren Kolligian Jr. Trophy". af.mil/News.aspx. Secretary of the Air Force Public Affairs. Retrieved 24 June 2014.